UPDATE: May 5, 2002. After posting this article two months ago, I have since come to the conclusion that it is not a good explanation of the phenomena of bow-lifting or stern-lifting propellers. I don't think I believe this myself, anymore! I'm going to give it more thought, but in the interim I will leave this material here so that the thread relating to it in the FORUM has the material to which it refers.--jimh. I was fundamentally curious about how a propeller accomplished what seemed to be to be a rather amazing phenomena. How could it know it was supposed to lift the bow or the stern? I began a hunt for the answer. As it turned out, I really never found a good answer in my search (which was was admittedly limited to on-line resources--I am sure there exists much scholarly research on this subject in the literature of the Naval Architect). Faced with this void of information, I began to consider the problem myself and to develop my own analysis and explanation. If you are similarly curious about these features of propeller design, I invite you to read on and discover the answer for yourself. There are three basic propeller designs that are often used in conjunction with boat propulsion: the "conventional" propeller, the "bow lifting" propeller, and the "stern lifting" propeller. These last two names refer to the ability of the propeller design to affect the trim of the boat's bow or stern while underway. These names are in widespread use in the marine industry, and they seem to be accepted by virtually everyone at face value. It is as if the underlying principle that governs their operation is so widely understood that it never needs mentioning. My experience, however, was just the opposite. Virtually no one could explain to me the actual principles that produced the lifting effects. What is behind these propeller designs? There was no argument that propellers called "bow lifting" actually did lift the bow more than propellers called "convetional" or stern lifting. Since all the propellers would operate in the same location and at the same angles with respect to the boat, something about the thrust vector they produced must be different. But this is the initial conundrum. How could a propeller rotating on a shaft, produce an asymmetrical thrust vector? In other words, how could the total thrust being produced by the propeller sum into a vector which was other than in-line with the axis of the propeller shaft? This was the essence of the problem. Without producing some type of asymmetrical thrust, no bow or stern lift could be achieved from any propeller. A propeller's ability to create a thrust vector that is not in-line with the propeller shaft is difficult to understand because we tend to think of the propeller as operating underwater. Intuition tells us that on a deeply submerged submarine, a spinning propeller is unlikely to produce any inherent tendency to lift or lower the stern of the submarine. Above, below, on all side, the propeller operates in an open and symmetrical environment of limitless water. We tend to apply this same model to boat propellers, but that is a crucial mistake. Unlike a submarine, a boat propeller operates near the surface and is surrounded by significantly different amounts of water. On each side and below are vast amounts of water, but above the propeller is only a thin layer of water. In addition, above the propeller there is usually a cavitation plate (or anti-cavitation plate), which also changes the symmetry of the environment in which the propeller rotates. The difference in environment in which a boat propeller operates as compared to a submarine propeller is key to getting effects like bow lift or stern lift to occur. Another important concept to understand is the shape of the thrust produced by a propeller. One can think of the thrust produced by a propeller as being in line with the propeller shaft, but this thrust is produced by accellerated water that is pushed aft by the propeller. The moving water is directed along the line of the propeller shaft, but it also has a diameter equal or greater than the diameter of the blades. As the water streams aft, it tends to spread into a larger diameter, so one can think of the moving water coming off the propeller as a cone. The apex of the cone is at the propeller, and the cone grows outward as it moves aft. As the accellerated water moves aft and outward, some of it reaches the surface of the water, where it breaks through into the air, releasing any remaining thrust. We are all familiar with this stream of white water in the center of our boat's wake. The thrust from the propeller stream that is lost into the surface affects the total thrust vector coming from the propeller. The shape of the cone of accellerated water that comes off a propeller can be controlled by varying the shape of the propeller blades. One element of the blade that is varied is the rake angle. The rake angle is the angle the blades are tilted back, akin to sweeping the wings of a plane back for high-speed flight. The "conventional" propeller generally has the blades set without much of a "rake" angle. Propellers which are termed "bow lifting" will have their blades set with a noticeable aft rake. Propellers with "stern lifting" abilities a usually not raked aft much at all, but have other blade shape characteristics. The effect of aft rake is to direct the water off the blade inward toward the propeller hub. The net effect of blade raking thus is to vary the shape of the thrust cone, causing it to become narrower than the conventional propeller's thrust. This narrowing cone of thrust can travel farther aft before it spreads to the point where it reaches the surface and gives up its thrust to the air. This has several beneficial effects. First, more thrust is contained in the water and less is lost to the air, making the propeller perform more effectively. In addition, the propeller has less tendency to cavitate or "blow out", with the result that a raked blade propeller is said to have better "holding" or better grip on the water. Finally, since less of the thust is lost to the air, the total thrust vector from a raked propeller is more in-line with the propeller shaft. Propellers designed to be "stern lifting" have little or no rake angle to their blades. This causes their cone of thrust to be rather "fat", with the result that much of the thrust breaks through the surface. Propellers of this style are often used on racing boats, and the roostertail of water that is seen behind them is clear indication of the thrust being lost through the water surface. In exchange, these propellers lift the entire stern of the boat out of the water, reducing the drag to just that of the propeller and shaft. To enhance this effect, the blade shape is often thickened at the trailing edge, making the blades resemble a meat cleaver. The "cleaver" blade generates additional lift because the propeller raises the stern so much that only half of the propeller is in the water at a time. Such "surface piercing" propellers reduce drag even more. The cleaver blade creates more stern lift. The blade entering the water on the downward rotation side generates more lift than the blade entering the air on the upward side, with a net result that the stern is lifted. A series of three illustrations below shows the general shape of the thrust cone coming off the propeller. The darkened arrow shows the net thrust that results after considering the thrust lost to surface breakthrough. 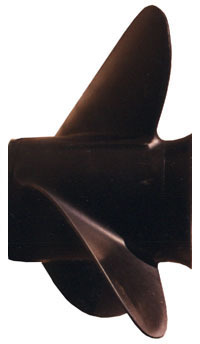 The typical "elephant ear" three blade outboard propeller produces a cone of thrust similar to the shaded area shown here. The loss of thrust through the surface results in the total thrust vector having a slight downward angle, shown by the arrow. 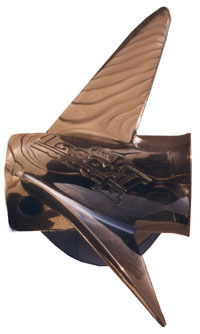 The typical "bow lifting" or raked blade outboard propeller produces a cone of thrust similar to the shaded area shown here. Less thrust is lost through the surface. The total thrust vector that results is greater and more inline with the propeller shaft. The thrust rotates through the boat's center of resistance and lifts the bow to a greater degree than a conventional propeller, hence the use of the "bow lifting" name. The typical "stern lifting" cleaved blade outboard propeller produces a cone of thrust similar to the shaded area shown here. Significant thrust is lost through the surface, producing the familiar roostertail. This results in the total thrust vector having a more downward angle, shown by the arrow, which causes the stern to lift. If you have a comment or question about this article, please post it in this message thread in the Whaler Forum. This article first appeared March 6, 2002.